I am always looking forward to Christmas Day – a day when I will receive "handmade gifts" from a couple of very important people. Kalinda and Felicia are one of those who never fail to intrigue us with their creativity and thoughtfulness. This year, Kalinda made us some really big brown cookies (wrapped in personalised bundle – even with expiry date printed at the base of the packaging!). And Felicia? 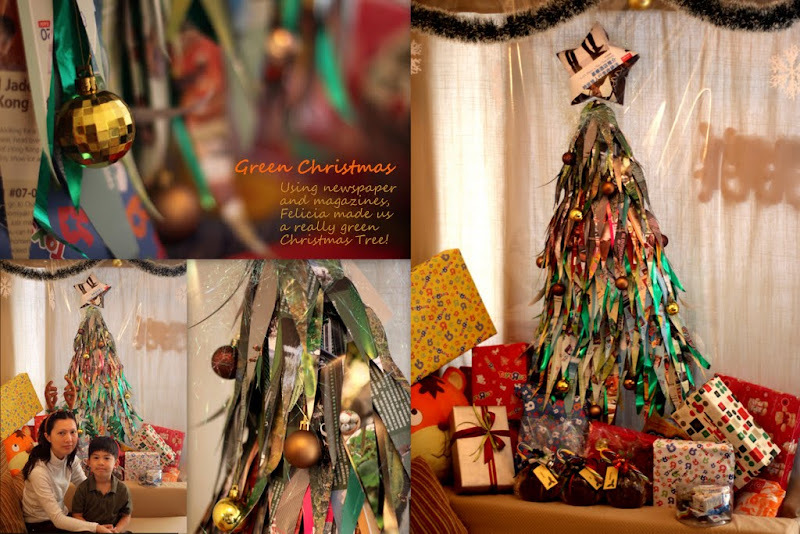 She cleverly used the wall space in our really tiny HK houe and erected a 1.2m tall "green Christmas tree" – using newspaper and magazine! It is the most creative and original Christmas Tree I ever seen! Our friends and families have been really kind to us. We received so many good wishes and gifts from abroad. Not to mention the same gesture and goodwill we received from our local HK friends. Right now, we are shifting our home furniture, preparing for the small Xmas gathering at my place tomorrow. Can’t wait to upload more "Boxing Day Party" photos for you guys! Love the tree, so creative!! I would love to do this with my kiddos, is there a website I can look at for instructions?